Wine bottles have a lot more to offer than what comes inside! Of course, you probably don’t have any in your home if you’re not a wine drinker, so being that you probably are since you’re reading this blog, why not use the bottles as a focal point or visually interesting piece of decor instead of just storing them in a cabinet or the refrigerator? Take a look at the many ways Barstool Comforts can help you display your wine bottles in style and free up some of that storage space for something else! Ideal for your kitchen, dining or even living room; this artistic wine rack is both beautiful and functional. Complementary earth tones will perfectly accent your home while seven of your favorite wines are displayed in a beautiful manner. Whether you are a frequent entertainer or just a wine enthusiast, this wonderful piece is sure to be a welcome addition to your home. 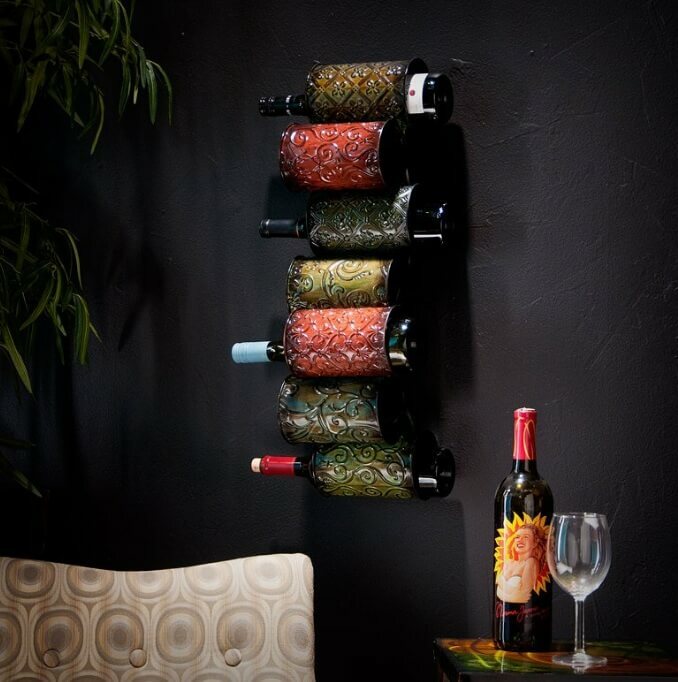 Create a work of art with your wine collection! This contemporary wall sculpture provides stylish storage and unique exhibition of your wine assortment. This artistic wall sculpture features a contemporary, geometric design of interconnecting rectangles and a lovely, soft black finish. It elegantly displays up to eight bottles of wine on individual, foldout holders. Share some of your fondest memories and sparkling personality by adding corks to each of the four enclosures. Break out the wine collection because you’re going to want to show it off with this wine organizer! Composed of five 3-D geometric abstract cubes, this highly useful and organizational unit disguises itself as an edgy piece of wall art. Display your wine elegantly with this wall-mount wine storage unit. Create an art gallery in your own home and enhance it with function. This abstract geometric panel wall sculpture is hand painted and can hold up to 8 bottles of wine! Rarely is there opportunity to combine two of your favorite things in such a mesmerizing way. All of your guests are sure to flatter you with compliments. Ideal for your kitchen, dining or even living room, this artistic wine rack is both beautiful and functional. Complementary earth tones accent the offset panels while 7 of your favorite wines are displayed in a beautiful manner. Whether you are a frequent entertainer or just a wine enthusiast, this wonderful piece is sure to be a welcome addition to your home. Ideal for your kitchen, dining or even living room; this artistic wine rack is both beautiful and functional. Complementary earth tones will perfectly accent your home while six of your favorite wines are displayed in a beautiful manner. Whether you are a frequent entertainer or just a wine enthusiast, this wonderful piece is sure to be a welcome addition to your home. 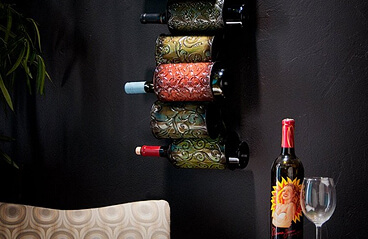 Dress up your home and your wine collection at the same time! This exquisite piece of metal art resembles a swatch pallet with its variety of patterns and hand painted colors. Each layer delicately arches to create 5 perfect wine bottle holders.